With the support of Fund for Lake Michigan and Brico Fund, Reflo teamed with Arts @ Large and Bradley Tech high school students to create the mobile MKE Waterscape Table. ... This exciting table is a perfect engagement tool for K-12 educators both within STEM/STEAM and social studies/ELA. It's local. It connects art and science. It uses gameplay to motivate discovery of local water history and inspire discovery about hidden water stories. Reflo’s Jose Basaldua shows the Virtual Water Table to guests at Maker Faire on Sept. 29, 2018. We are proud to report that we engaged over 1,000 guests with the Virtual Water Table at this year’s Maker Faire at State Fair Park on Sept. 29-30, 2018. It was our first year at the Maker Faire, and we had a great time. There is something ineffably compelling about the Augmented Reality Sandbox that inspires childlike curiosity and imagination in young and old alike. We heard numerous times, “This is the coolest thing I’ve seen all day!” Many people asked how to build their own or expressed a desire to buy or rent ours. Some were surprised that a nonprofit was capable of creating something so innovative. Others imagined ways they would want to expand the programming. Educators came by to network with an interest in collaborating to share the value with their students. Parents and grandparents in some cases had to pull their young ones away or they would have played in the sandbox all day. We are proud of the work and passion our team has invested in this project. In a few months we aim to mobilize the Virtual Water Table among schools in concert with motivated teachers hungry for an engagement tool aligned with water-related curricular connections. Special thanks to all team members who volunteered their time to showcase this novel resource: Jose Basaldua, Mike Rea, Bryn Summers, Justin Hegarty, Wilniesha Smith, Michael Timm. Reflo’s executive director Justin Hegarty shows how to make it rain on the Virtual Water Table. Reflo’s Jose Basaldua watches as a family explores the Augmented Reality Sandbox. At Maker Faire we also demonstrated the updated MKE Waterscape role-playing game. The Virtual Water Table promotes intergenerational interaction, reminding us of our human instinct to touch and connect. The game design team poses for a group shot during Maker Faire 2018. From left to right: Justin Hegarty, Mike Rea, Bryn Summers, and Michael Timm. We bid Bryn a fond farewell as she moves on to an exciting new job! Thank you for sharing your time, talent, and enthusiasm to collaboratively create something amazing. Join us at Maker Faire! Come visit us at State Fair Park this weekend and check out our Virtual Water Table! We’re excited to share this mobile engagement tool that combines an Augmented Reality Sandbox, a Milwaukee water history inspired role-playing game, and the magic of the Milwaukee Community Map in Google Earth. 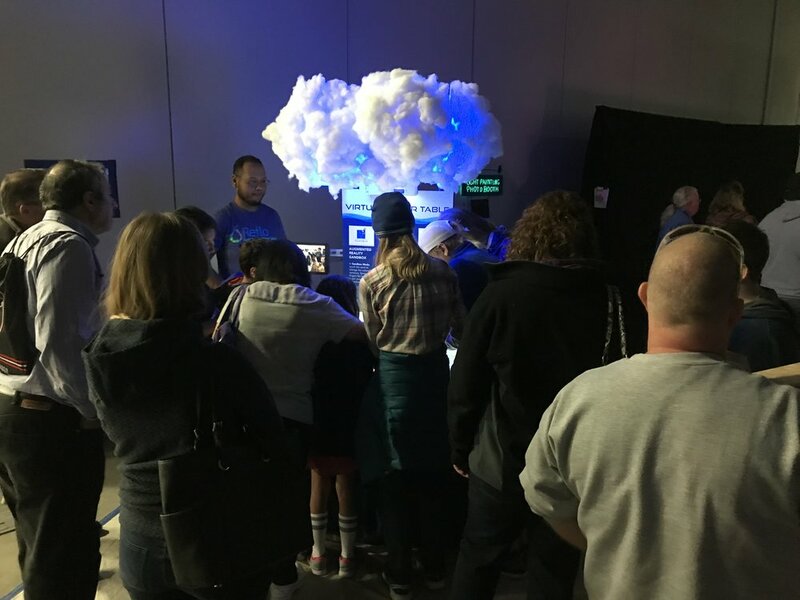 Maker Faire is an amazing family-friendly event where hundreds of creative people gather in a free event combined by a passion for human exploration. We hope to see you in the dark room at the expo center! Thanks to Rose Kuzj for designing a wonderful poster to help share the table’ story. Although we took a late-summer blog-posting hiatus, our team has been doing a lot of behind-the-scenes, in-the-code-trenches work to bring the Augmented Reality Table and MKE Waterscape game to fruition. The results will be on display at the Maker Faire at State Fair Park on Sept. 29-30. We'll be showcasing the AR table in the dark room of the exhibition hall. The event is free and should be a blast. You can get tickets at the door or in advance. After that, we'll be putting some spit and polish on the AR table with the intent to have it ready to be shared more widely beginning in 2019. Stay tuned for updates through the Green Schools Consortium of Milwaukee. If you are a teacher who wants to learn more, please email us directly: mtimm@refloh2o.com. Meanwhile, enjoy some photos from the past few months of the Milwaukee Water Stories program. The fine folks from the Milwaukee County Land Information Office came by to playtest our game in July. Representatives from Milwaukee Water Commons and Port Exploreum offered feedback during another summer playtest. Showcasing the Milwaukee Community Map at a professional development session for educators focusing on Great Lakes sustainability at Riveredge Nature Center in August 2018. Environmental educators loved the Augmented Reality Table when they got a sneak peek at Riveredge Nature Center for the August 2018 professional development session. Showcasing the table, map, and game to the fine folks at MMSD in August 2018. Solving a vexing challenge to connect the Augmented Reality systems with our game design. Thanks, Mike! 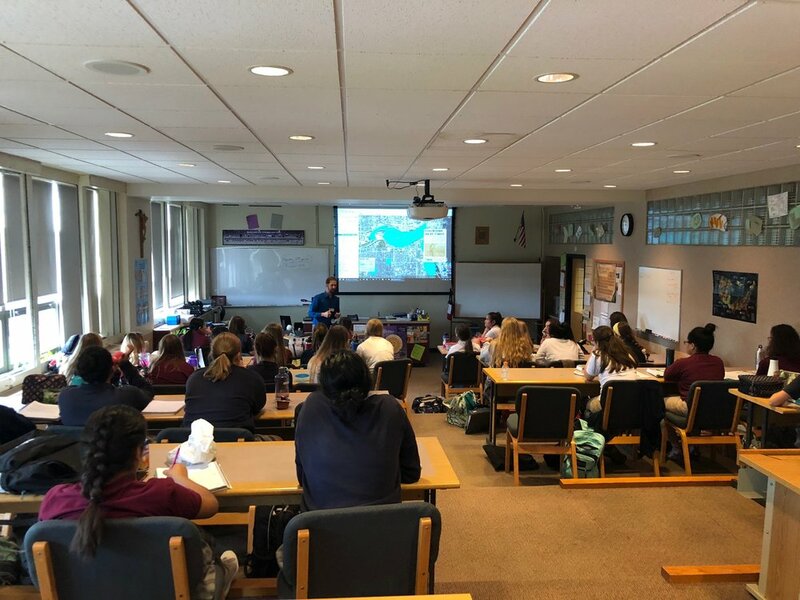 Sharing the Milwaukee Community Map with 40 students from DSHA's AP environmental science class in September 2018. Join us for a Thursday evening playtest of a cool new game! Hooray! Yesterday we debuted the MKE Waterscape Game at the Green Schools Conference at Fernwood Montessori School in beautiful Bay View! Over the next few weeks we're tidying up bugs and fine-tuning the Augmented Reality interface. Stay tuned for more photos and an invitation to playtests later this summer. Our team proudly presents the demo of the MKE Waterscape Game at the Green Schools Conference on June 14, 2018. Dozens of people experienced a taste of this unique educational engagement tool. Game demo is next week! Our team is working furiously to bring you a demo of an amazing new game where five players explore and co-create Milwaukee's waterscape as you've never seen before. Start in the past and play through scenario stories inspired by real history that shape how our city evolved in its relationship with water. The game is intended for ages 13 and up. We are excited about sharing it with educators passionate about new ways to engage the next generation. Register to attend conference on June 14. Experience our relationship to Milwaukee's ongoing water story in a new, fun way. Explore how Milwaukee's waterscape evolved through time in our MKE Waterscape Game, a role-playing experience inspired by our city's real water history. Two weeks until we debut the table game at the Green Schools Conference at Fernwood Montessori School in beautiful Bay View on Thursday, June 14! There are still event tickets available here! Meantime, our team has been hard at work pulling everything together for the demo. Lauren Brown has completed an richly interlocking suite of beautifully illustrated maps that transport our players to historic Milwaukee in much the same way readers of Tolkien are transported to Middle Earth. Our User Interface art is almost complete. Allow us to tantalize you with some of the bold iconography artist Dionna Hayden has crafted to signify some our game's character roles. 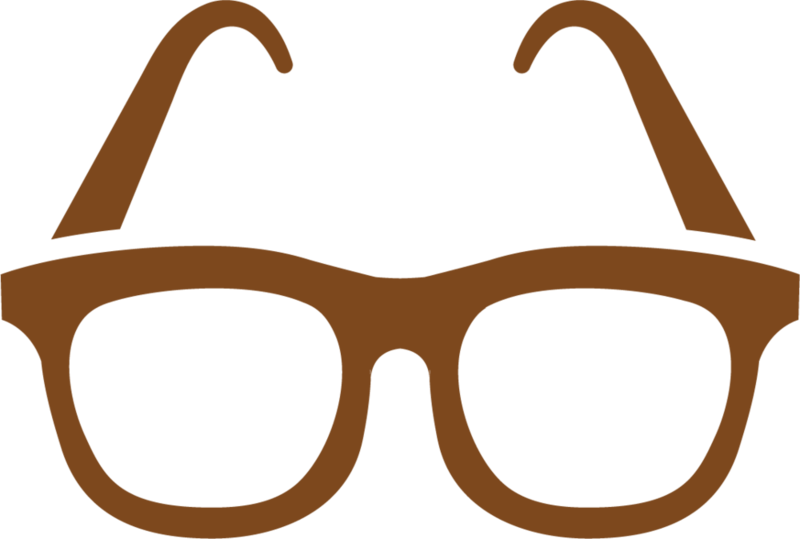 We think they're vivid, clear, and engaging. 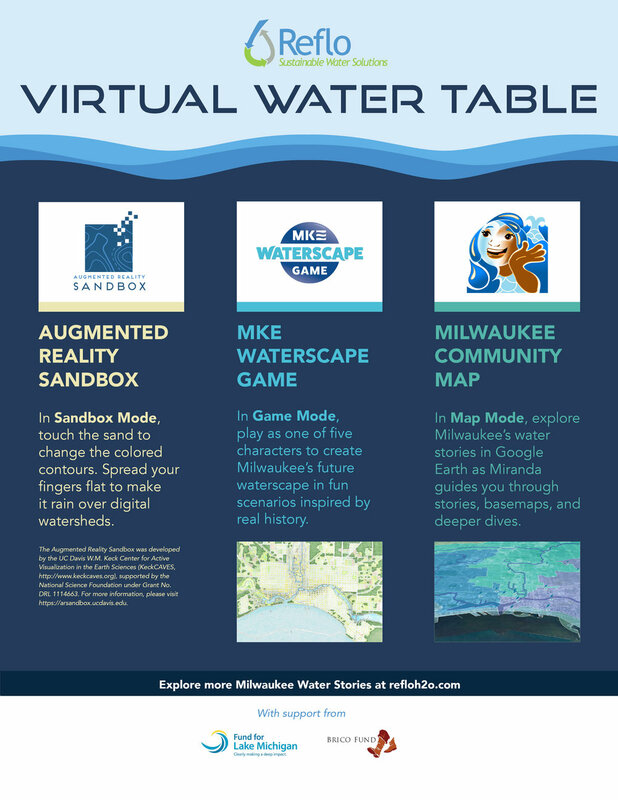 At the conference, we will be presenting the three phases of Reflo's Milwaukee Water Stories program: the Milwaukee Community Map, the Augmented Reality sandbox table, and the MKE Waterscape game. The game will be showcased on a smartboard in the exhibition space so anyone who wants to can see it and play around with how it will work. Ultimately, one way the game will be played is on the AR table using special cards that our players will use to make choices in the game like whether to evict fishermen to expand a factory, build a dam to construct a canal, or dig a new harbor mouth or keep the old one. Through role-play, the game is a way to explore the actual choices our forebears made over a century ago, leaving as their legacy our present waterscape. The game puts the choices in our hands: what kind of future waterscape will we create together? What are the costs of those choices? We are pleased to introduce Mike Rea, the newest member of our game design team. Mike joins us as principal game developer, which means he'll be crafting the code that makes our game go. He has some great ideas about solving the trickier programming challenges we've come across throughout our design process, and we are confident in his Unity game design expertise, his unfazed approach to problem-solving, and his can-do attitude. Yes, bowties are (still) cool. With a month to go before we share our game prototype at the Green Schools Conference June 14, our team is humming with positive energy, and we're excited to share it with you! Level 1 of the MKE Waterscape game takes place in Milwaukee's past, with dramatic scenarios inspired by actual history. Together (or not!) five players make choices that create alternate pasts, presents, and futures of our city and our water. Enjoy a sneak peek of some of Lauren Brown's game board artwork as we advance toward completion of the first level of our role-playing game. Can you identify some of the areas depicted below? Can you imagine how things might have developed differently than they have? Do you know what occupies this land (and water-)scape today? Our team has been busy making progress on several fronts. We're pleased to share some images showing the process of creating art assets that will integrate with the map layer of our game. Artist Dionna Hayden shared some draft sketches that are evolving into iconography for our game. To right are some draft sketches by Lauren Brown for our historically inspired Milwaukee's "Past" Level 1. The game design programming is also coming along and we look forward to sharing more updates in the weeks to come. Mark your calendars for June 14 and the Green Schools Conference! Early concept sketch of Jones Island history. 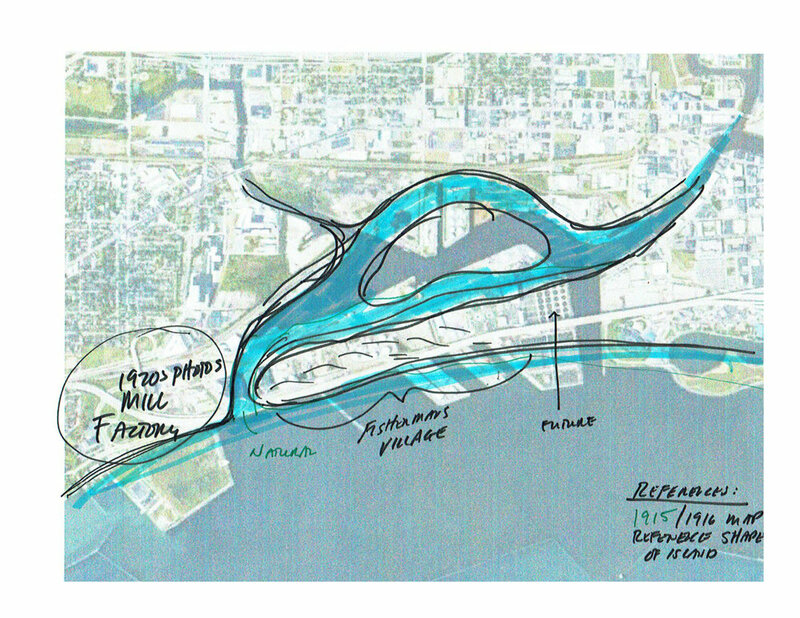 Early concept sketch of Milwaukee River history. Back in the sandbox again... The AR table unleashes and augments the imagination. A big hit... The AR table attracts attention of a wide range of ages and interests. A place for all hands... The AR table invites cooperative interaction by its very nature. While our artists are hard at work refining draft designs for the next iteration of our game, Reflo is proud to be part of Riveredge Nature Center's STEM Into Nature event, showcasing the Augmented Reality Milwaukee Waterscape Table. Dozens of students of all ages engaged with the table, learning how landforms affect water flow (and in turn quality), what it means to be a watershed, how basins interconnect or divide the way for waste or invasive species, and, let's face it, just had a great time collaboratively making interactive formations in the sand. There's something transfixing about this tactile engagement and the gather-round-friends-to-co-create-something aspect that never ceases to paint smiles on faces young and old. We've observed a magic in this most human of interactions. And we are pleased to share the platform for this experience with audiences throughout our area watersheds in order to foster a greater sense of watershed citizenship. Citizenship starts with awareness of rights and responsibilities. Awareness ignites upon inspiration. Inspiration sometimes requires an intervention. In this case--something as simple as a sandbox is igniting the imaginations of a new generation of watershed citizens. Onwards (or should I say, downstream!)! Come visit--the table will be on display at STEM Into Nature through Saturday, May 5. Riveredge's talented educators made linkages between not only physical dynamics shown through the table but also human dynamics like Foxconn's application for water and the Great Lakes Compact. An impromptu visit from some preschoolers proved that the table is also a huge draw for Riveredge's youngest guests. They loved making it rain! The joy was unmistakable written across the faces of youth who enjoyed creating craters, mountains, islands, rivers, lakes, and plateaus. Our team added Lauren Brown and Dionna Hayden to the project this week. During an intensive workshop at Arts @ Large, we considered some historic reference maps and drilled into what the various "Past" level scenarios will look and feel like. It was exciting to see Lauren plunge in and breathe a new dimension of life into our plans. 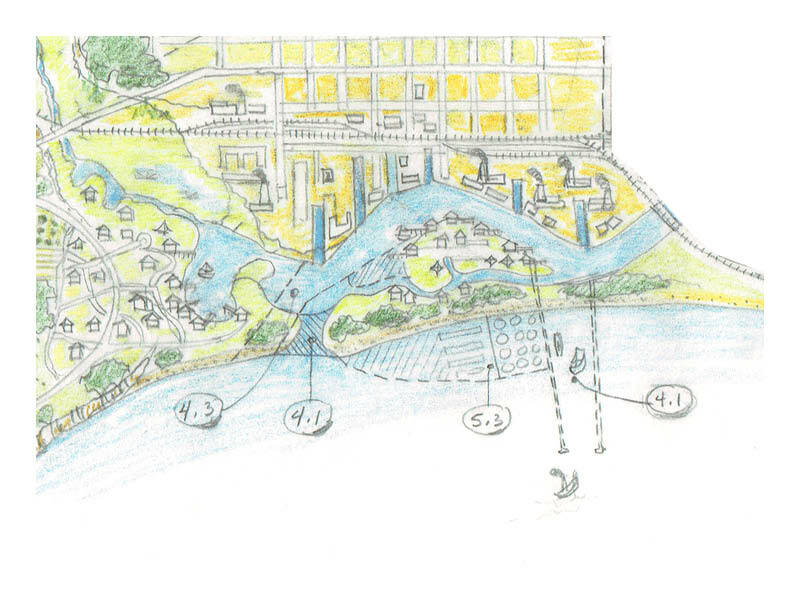 Our game exposes how humans transformed the Milwaukee waterscape and invites consideration of how those choices were made and how alternate choices could have led to divergent outcomes. The workshop was all about aligning the game's vision and design with an artistic sense of interactive cartography. Our game also invites players to bring different perspectives to the table by role-playing one of five different characters who choose how the Milwaukee waterscape evolves. Dionna's insights on how to represent those characters and their special abilities to our middle-grade and high-school audience will be key in creating smooth, enjoyable gameplay. We love the insights and expertise Lauren and Dionna have already brought to the process and look forward to sharing a sneak peek at these talented artists' work in the coming weeks! Lauren Brown considers the evolution of Jones Island to be represented in one of our scenarios. Bryn Summers and Lauren Brown collaborating on how to balance competing elements of the "Past" level design. We are excited to share publicly that we have arranged to work with two talented artists to add the visual elements to the MKE Waterscape game. Lauren Brown, landscape architect with extensive experience in collaborative watershed visioning and a painterly illustration style, will be joining the team to create illustrated maps for the game scenarios. Dionna Hayden, artist and designer with a knack for intuitive graphics and a passion for engaging kids, will be joining the team to create User Interface art and design elements. We couldn't be happier to work with these two talented women and look forward to everyone experiencing the fruits of their labor in June 2018. Stay tuned for other exciting news as well. Things are churning in a positive direction! Thanks to Harbor District Inc.'s Tony Giron, Milwaukee Water Commons' Anne Bohl, and School of Freshwater Sciences' Brennan Dow for recently playtesting the "Past" level of our game. We continue to playtest the MKE Waterscape game with adults in April to prepare for playtesting with kids in May. Riveredge Nature Center educators gave the game a go recently. Excited about the multiple levels of engagement, they started to envision ways the game could connect with middle-school and high-school curriculum, an effort we will be inviting teachers to explore more deeply this summer. We also connected with some talented illustrators who will be creating the artistic maps and iconography for the game. The Augmented Reality table was also on the road again, including at the MPS STEM Fair at Miller Park. And coming up, we'll be demonstrating the table up at Riveredge for their STEM Into Nature event May 3-5. Our team has been busy with behind-the-scenes work related to the imagery that will ultimately appear in the game. We are also continuing our Friday pizza playtests and looking forward to some exciting announcements in the coming weeks. The AR sandbox itself will be taking another journey next week, this time to the MPS STEM Fair in Miller Park. Bryn shows off the fabulous draft User Interface concept. Although our Augmented Reality game will ultimately be played in the space above a flat white surface, the projection looks pretty dang cool on the sand. Pizza Playtests Scheduled for April! Contact Michael Timm at mtimm@refloh2o.com to sign up for this fun, free way to spend a few hours with lunch provided. Feedback from playtest sessions will improve our game. August Ball (center) makes it rain. Jose Basaldua shows the table off to youth at the first-ever green jobs expo. Our fearless leader, Justin Hegarty, gives new meaning to the phrase "in the cloud." We took the Augmented Reality Waterscape table on the road for the first time to the inaugural Youth Green Jobs Summit organized by August Ball and Cream City Conservation Corps (C4) and hosted by the Wisconsin Black Historical Societ on March 15, 2018. The table ignited the curiosity of over hundred people, many of them area students. The awe and excitement glowed on their faces as Reflo's Jose Basaldua and game designer Bryn Summers shared the story of the table. At first some people were tentative about touching the sand to change the virtual watershed contours, but soon they were building mountains, craters, lakes, valleys, and canals of their own devising--not to mention exerting the power to make it rain with nothing but their outspread fingers! Youth who participated in the first-ever Milwaukee summit connected with local environmental nonprofits to forge connections and learn about career pathways right here in Milwaukee. It was a high-energy day, with high school youth charged to "take over" the city's water, energy, food, soil, and natural spaces sectors not only for jobs but so their voices are represented in decisions affecting our city's relationship to the environment. C4's August Ball reminded the audience that young people have always driven epochal change by demanding it. Addressing the young people, she declared her hope and her challenge that they not only participate to find job pathways but also to transform our society: "You are not just our future. You are our now." Our team coordinated to transport, set up, and calibrate the AR table off-site. We joked throughout the process about our "SOP"--standard operating procedures--regarding transporting this novel and bulky device, which requires a bit of disassembly and reassembly. Things we learned: bring hand sanitizer and a hand broom. All in all, transport worked fairly well. Friday, March 16 features the first formal playtest of our paper prototype role-playing game. If you or a group are interested in participating in future playtests, drop us a line! Much of this week's work focused on wrangling together the list of needed art and UI (user interface) assets. Then we did some conceptualized sketches of how these assets can relate on the AR table. Our upcoming task list now includes articulating scopes of work for game programmer and game artist, identifying reference imagery for all assets, prepping playtestable cards, and exploring technical options regarding Unity, Google Earth, and Linux. Bryn Summers walks Ross Klettke through our character role concepts. Each character possesses two special abilities. Justin Hegarty discusses the AR hardware with Ross Klettke. The current iteration of the table is the tip of the iceberg of possibilities. The visual core of our game concept is an overhead map of Milwaukee that evolves as players make choices that affect the collective "waterscape." 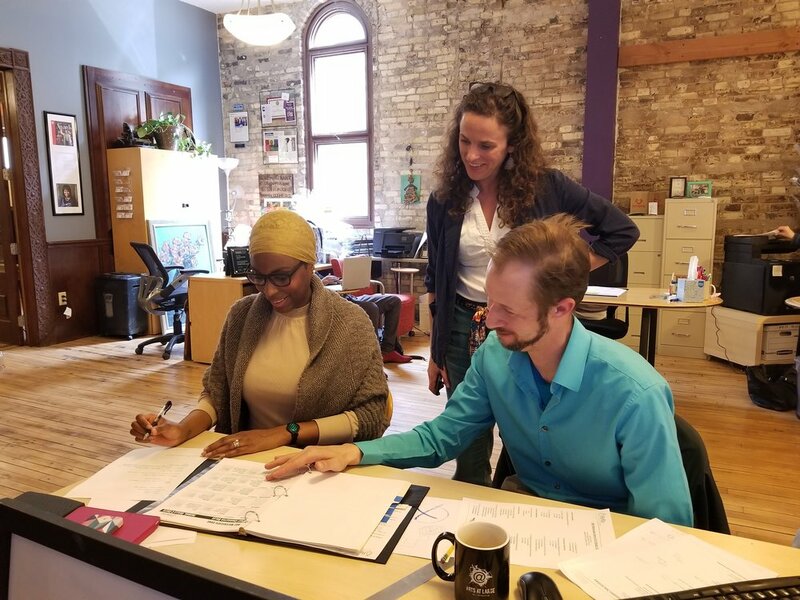 We've devised 15 role-play scenarios inspired by Milwaukee's actual water history and the drivers of change identified in the Great Lakes Futures Project. In the game, there are five scenarios per level representing past, present, and future. 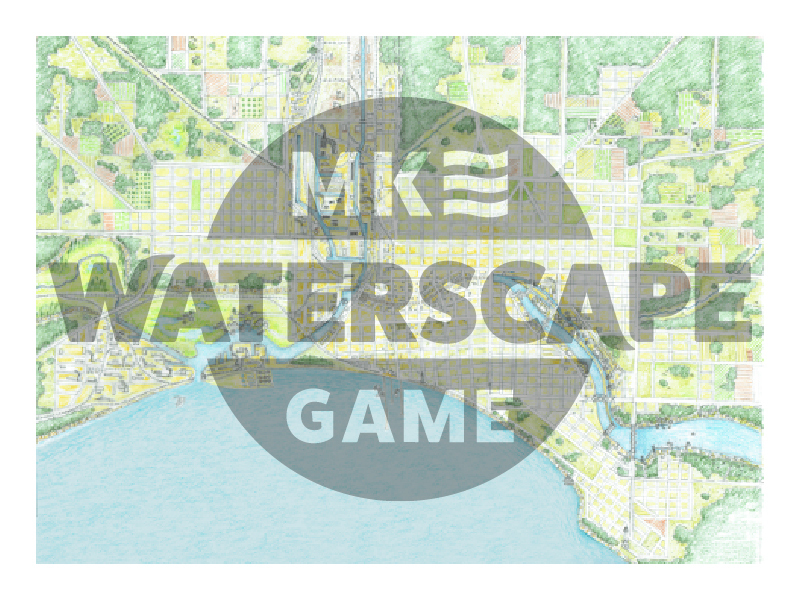 Game designer Bryn Summers considers the balance between user interface and art assets for MKE Waterscape on the AR Table. Our team met again this week to create the role-playing game's simulated economy and work through how different roles will have different special abilities. We used a jar of washers we found in the Arts @ Large basement to stand in for in-game currency. This allowed us a quick-and-dirty test of the basic mathematical relationships for how roles interact with scenario choices. Although we're building a digital game, there's nothing like paper, pencil, and physical objects to work through a prototype. In a few weeks, the paper prototype will be ready for playtesting. Drop us a line if you want to try it out! If you or someone you know is fluent in Linux coding and would like to help create this awesome Augmented Reality role-playing experience, let us know.